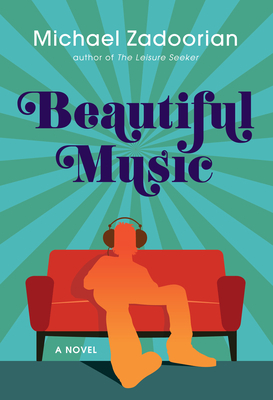 Beautiful Music (Paperback) | Fountain Bookstore, Inc. I am such a huge fan of this book and this author. Beautiful Music, set in 1970s Detroit is just what the title states. A young Danny Yzemski is growing up chunky kid with a love of pop radio and an turbulent home life. He starts his freshman year in a new school being confronted by racial tension issues previously he only experienced through the news and his mother's snide comments. When a tragedy happens, Danny's mom becomes more and more obsessed with the world's cultural changes and tries to drive them out of her life with booze and pills. In this storm, Danny finds comfort in music. Like beautiful music, this book is permeated with the power to make you sad, lift you up, and carry you home. "Beautiful Music is a sweet and endearing coming-of-age tale measured in album tracks." "For Danny, cracking the seal on a fresh piece of wax and dissecting cover art and liner notes are acts of nigh religious experience that unveil to him a community of fellow rockers across Detroit...It's in these small moments--a lonely boy experiencing premature nostalgia--that Zadoorian shines." "His third novel--Beautiful Music, about a radio-loving teen's transformation through music during the early '70s in Detroit... is] rich with Detroit details (Korvette's, Bill Bonds, Iggy Pop), and] follows Danny through racial tensions at high school, his changing body and his imploding family life." " Zadoorian's] new novel speaks of death, race, music and youth in a voice that has been compared to Nick Hornby and Tobias Wolff. It is set in 1970's Detroit at the cusp of punk, and centers around high school loner and music fanatic Danny Yzemski. One to look forward to for fans of rock music and sad, funny writing." "Zadoorian takes us back to Detroit in the 1970s, which was still throbbing from the 1967 rebellion, and was in the throes of the energy crisis and the sexual revolution. Protagonist Danny Yzemski finds that growing up in such times can be...complicated. But with a little help from Iggy Pop, the MC5, and Led Zeppelin, he finds just the boost he needs to survive--and even grow a bit." "Beautiful Music is not only a testament to the rockin' jams that propelled Motown to become reknown as Detroit Rock City, it swells with the beautiful music of a lively soul...Beautiful Music is touching, hilarious, and heartbreaking, much like the gamut of emotions you may have felt the first time you heard your favorite song. And much like that first, mind-opening musical experience, you'll return to certain passages within this novel because like the perfect song, it hits all the right notes--something you can feel deep in your gut." Michael Zadoorian is the author of the critically praised The Leisure Seeker--now a film starring Helen Mirren and Donald Sutherland, released by Sony Pictures Classics this year. Zadoorian is a recipient of a Kresge Artist Fellowship in the Literary Arts, the Columbia University Anahid Literary Award, the Great Lakes Colleges Association New Writers Award, and the Michigan Notable Book Award. His other books are Second Hand: A Novel, and the story collection The Lost Tiki Palaces of Detroit. His fiction has appeared in the Literary Review, Beloit Fiction Journal, American Short Fiction, Witness, Great Lakes Review, and the North American Review. He lives with his wife in the Detroit area.